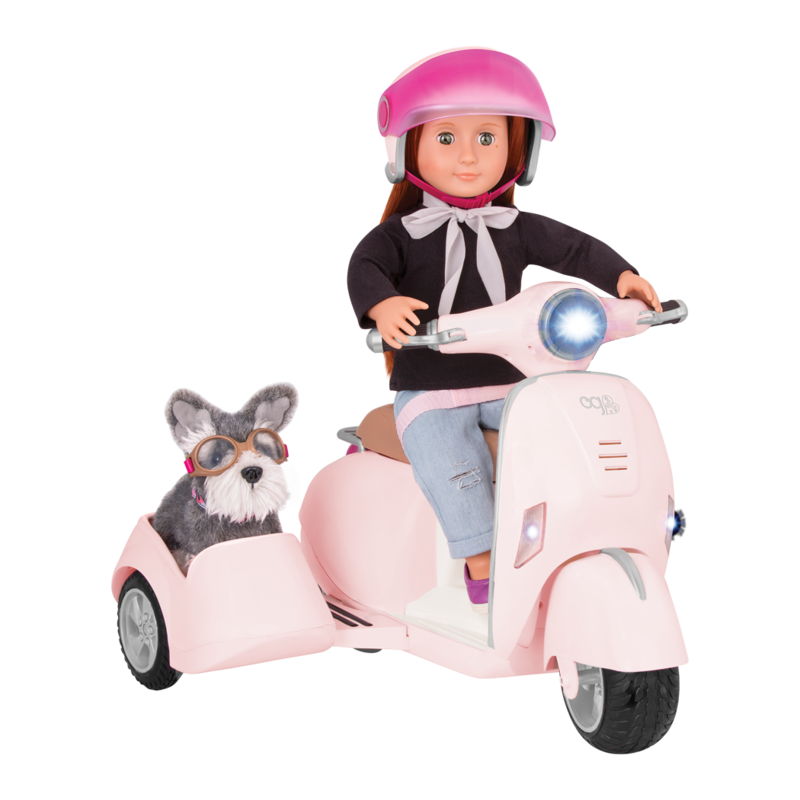 The perfect scooter for 18-inch dolls and their furry friends! The movies. A best friend’s house. The White House. Are we girls going places? Boy, are we ever. 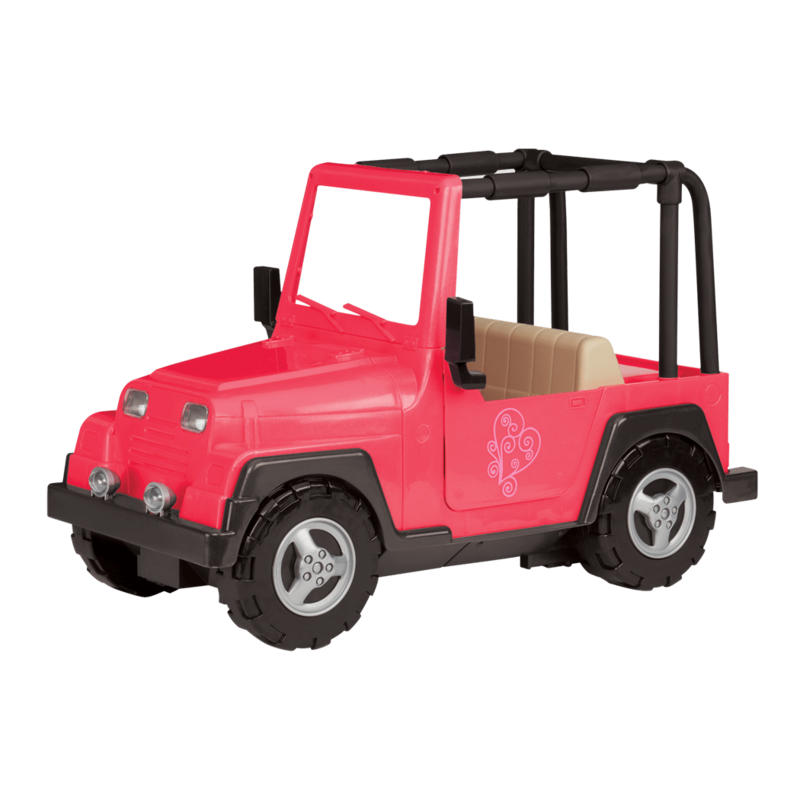 Our Generation, the perfect vehicle for 18-inch dolls and their four-legged friends! 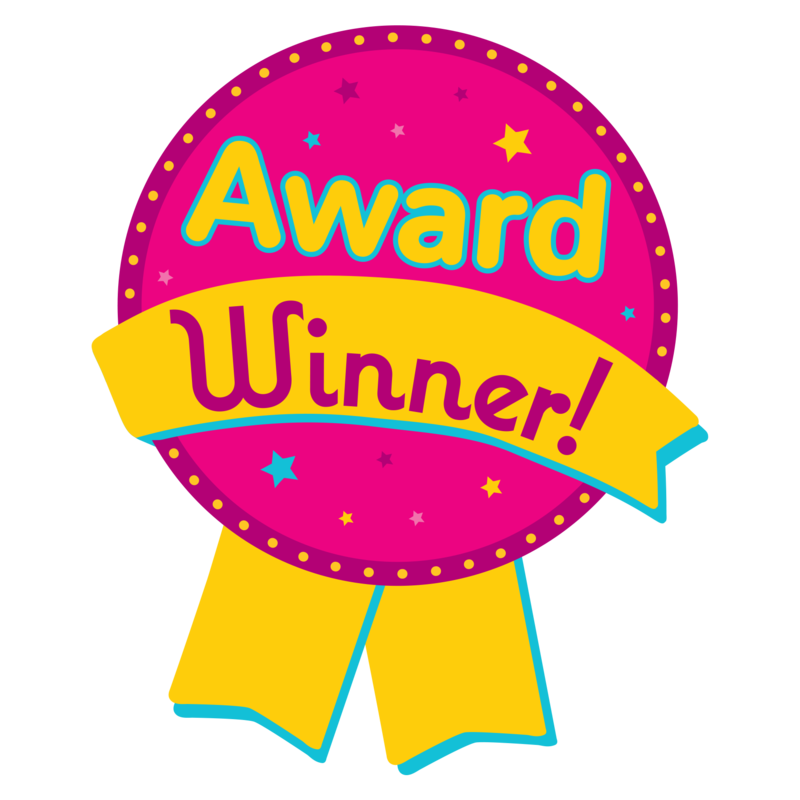 Winner of the 2018 Family Choice Award and others, this scooter is going places! We’re ready to ride with a furry friend by our side! 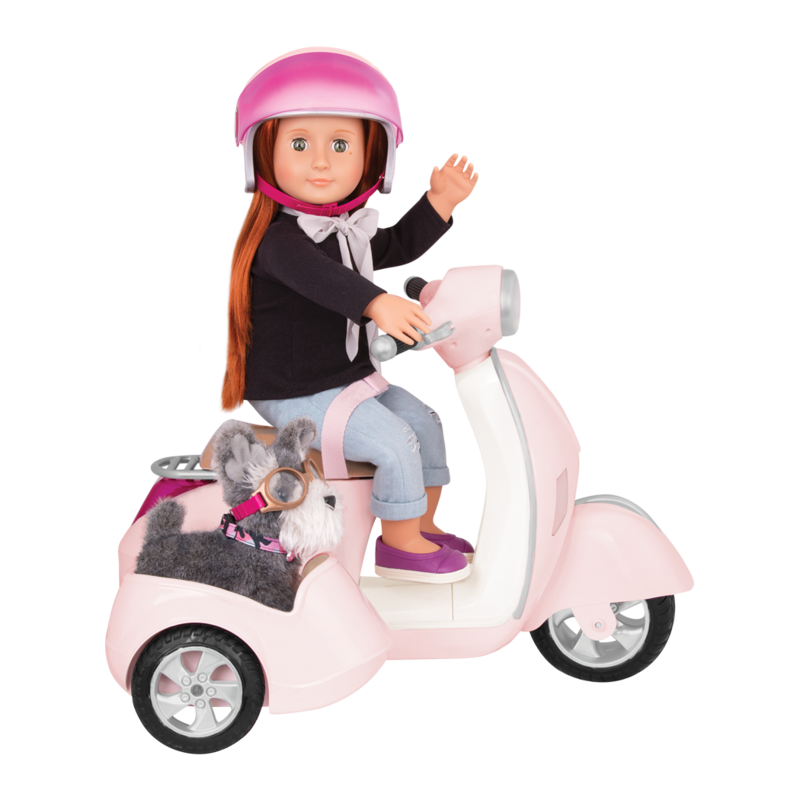 The OG Ride Along Scooter has everything you need to help your 18-inch dolls cruise into adventure. 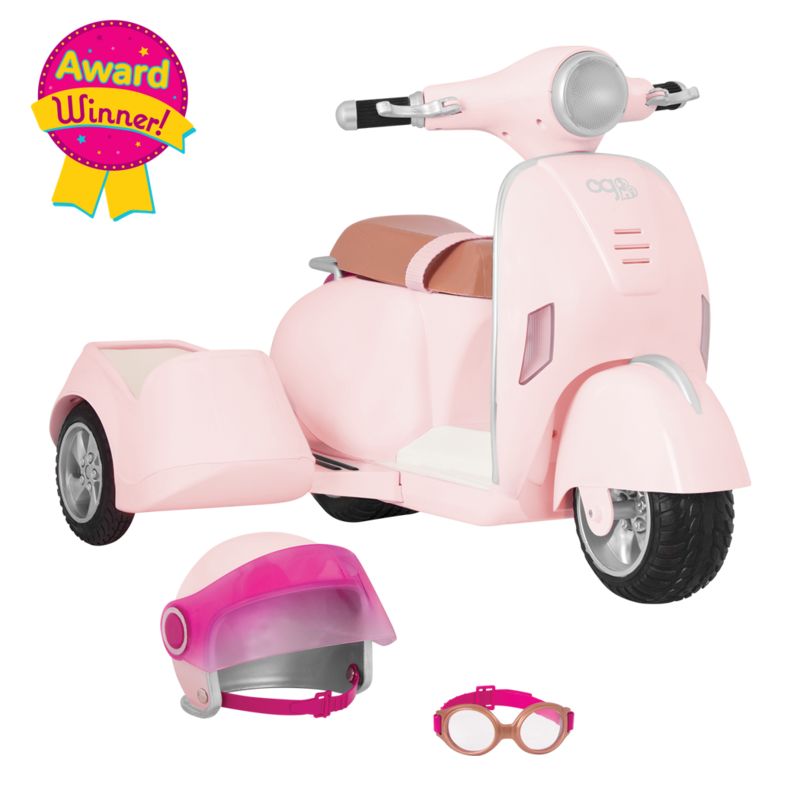 Featuring real engine and horn sounds, working headlights and brake lights, and safety gear for both doll and pooch, this scooter will take you on endless adventure! 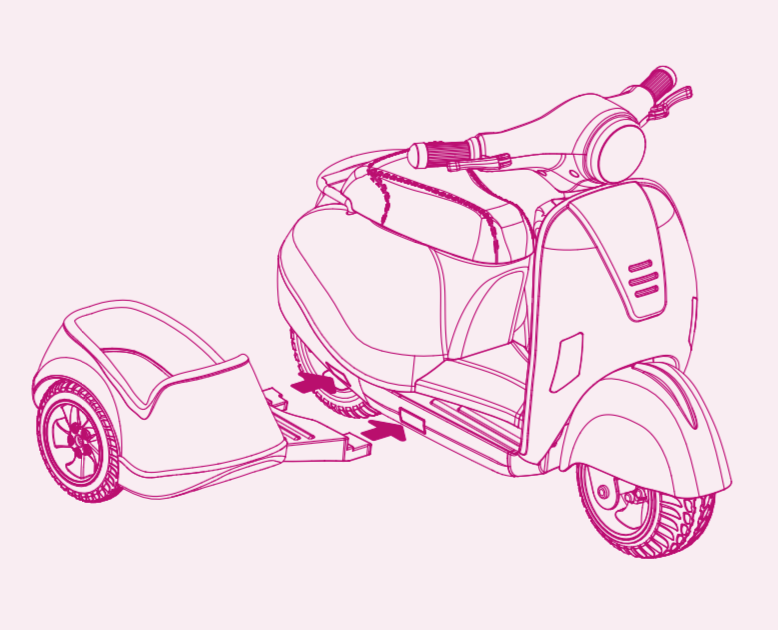 This scooter is the perfect ride because you can enjoy it two ways (and we sure love choices!) The OG Ride Along Scooter has a special sidecar designed perfectly for pups (or other pals with paws), so you can bring your furry friends along on adventures. When it’s time for a solo trip, the sidecar detaches – just snap it back on when you’re ready to take your pup out for another spin. 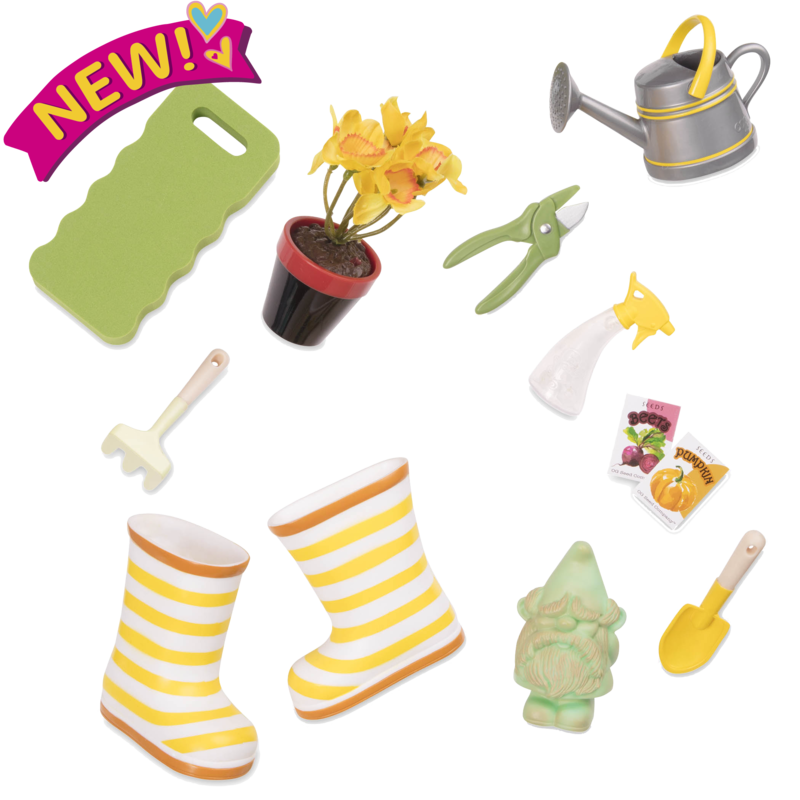 If you need to bring some treats for the road trip you can keep them in the handy storage compartment under the seat! 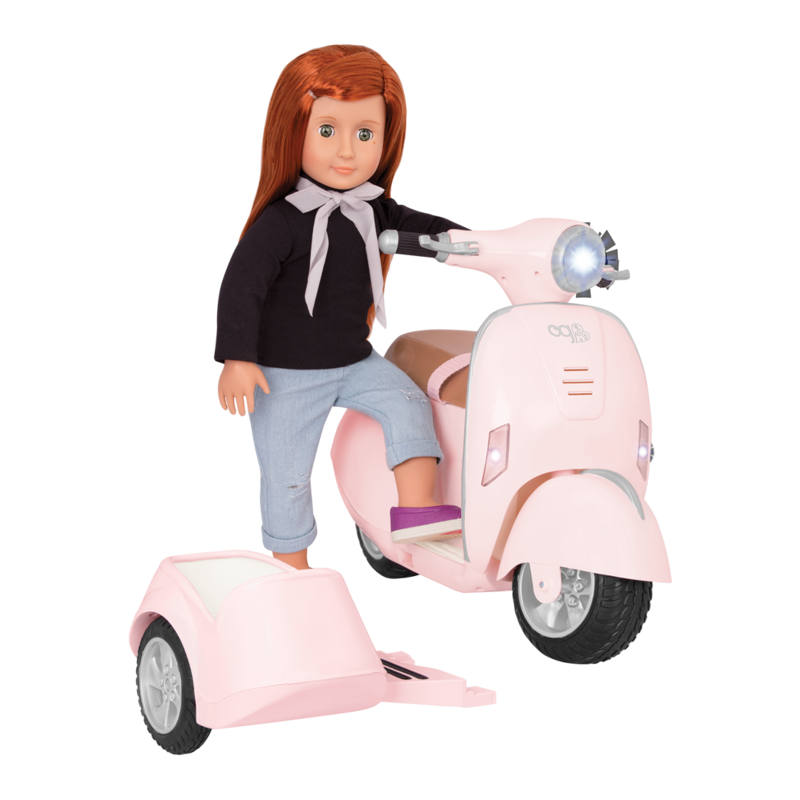 Have you met Sabina, the doll in the photos of the Ride Along Scooter? Sabina is a beautiful 18-inch doll who has long, straight red hair, freckles, and green eyes. She loves taking her Schnauzer Pup on adventures! Which of your favorite dolls and pups will you travel with? For the perfect driving outfit, try the Back to Cool outfit with sunglasses and a cool leather jacket! 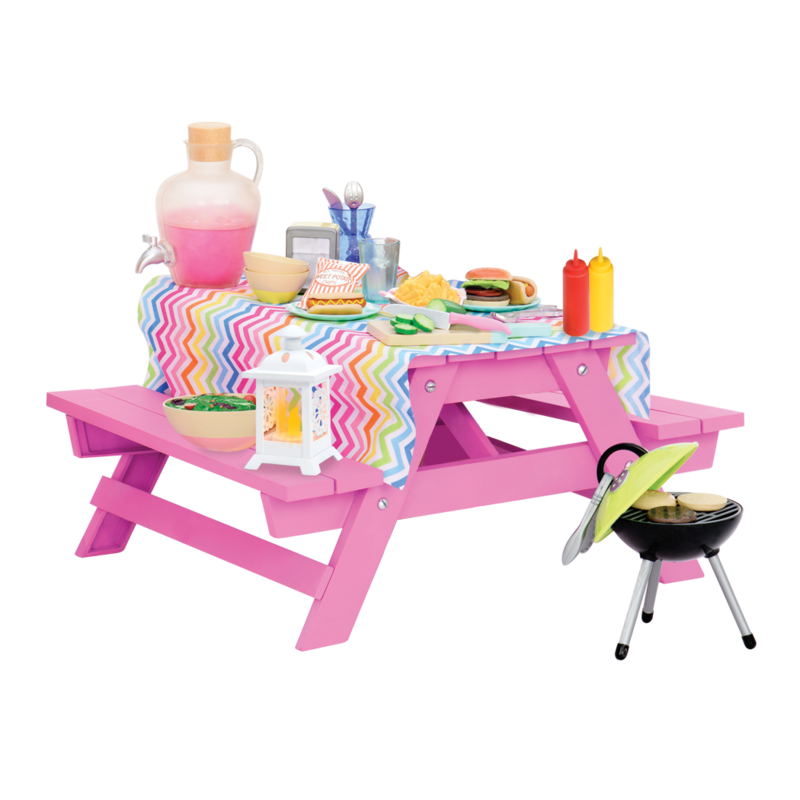 Once you reach your destination, the Pet Care Playset will give your pup a place to rest and eat its favorite treats. 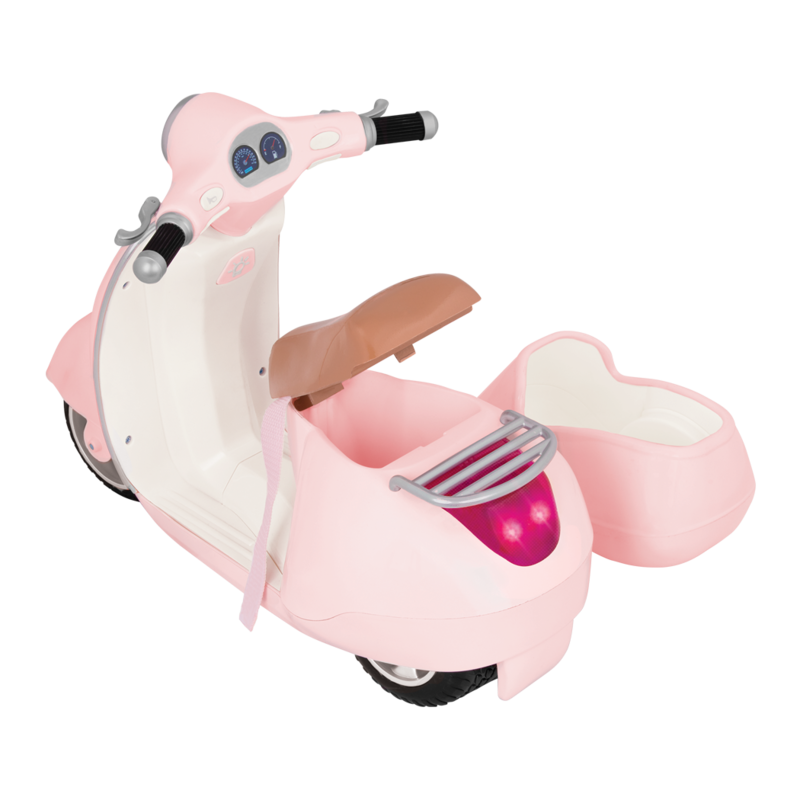 The Ride Along Scooter arrives fully assembled, so you can have fun playing with it right away! The first thing you will need to do is locate the power switch. In this case, it is located on the underside of the scooter. To start playing with your Ride Along Scooter at home, please make sure the power switch is set to the "Play"position. When you are finished playing, you can turn it to the "OFF"position to help preserve the batteries.